This group portrait features six horses. Please click on each image below to see a larger view. To view the complete group portrait of all six horses click here. 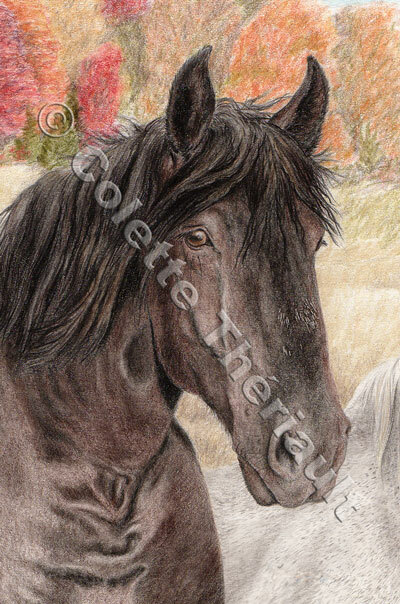 Part of a group portrait of six Percherons-approx. size: 23" x 40"
Prince's peculiar ears are instantly recognizable with their inwardly curved appearance. He is the largest of the group of Percherons and the only black horse devoid of a blaze or white marking on the face or forehead. Prince is said to be a proud fellow, with head held high all the while showing off his rippled, muscular chest. He can almost always be found with his favorite buddy, Jane.